Sir Don Black is on record as considering Judith Owen 'such an emotional songwriter [who] digs deeper than most'; here, on this 13-song album, the Welsh singer digs even deeper than usual to produce one of the most personal recordings you're ever likely to hear. Many of the songs on Some Kind of Comfort featured in the recent West End show Losing It, a 'mental health comedy' which starred Owen and Ruby Wax and dealt with depression (an illness that has severely affected both women's lives), and there is a cathartic, healing quality in the rigorous examination to which Owen subjects herself throughout this mesmerising set. Her overall sound, a pure-voiced confidingness over hypnotically rolling piano reminiscent of both Joni Mitchell and Kate Bush in her more intimate moments, is both beguiling and convincing, but it is the sureness of emotional tone that makes the album so successful. Many of the songs' specific subjects (all are basically about depression in its many forms) have been visited before by singer/songwriters: Joni Mitchell's 'People's Parties', Tom Paxton's 'So Much for Winning', Janis Ian's 'At Seventeen' and Loudon Wainwright's 'Muse Blues' – to mention just four (almost) at random – deal with very similar subjects to many of the songs here, but it is the consistency, integrity and sheer thoroughness of Owen's study of depression, its roots and manifestations, that render this album so moving and valuable. Impeccably backed by the subtle bass of Laurence Cottle and the cello of Gabriella Swallow, and with elegant, unfussy string arrangements by Robert Kirby and Jay Weigel, Owen has produced her most musically cohesive and moving album to date. 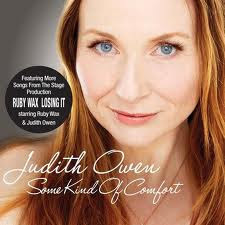 If you would like to see Judith perform live, you can see her at The Pheasantry in Kings Road, London on Monday May 21st with Laurence Cottle and Gabriella Swallow. Tickets sell fast, so book soon!